The Edo period shogunate received annual tributes from local clans, on the order of the rice to feed a thousand people. The sengokubune ships used on this route were suited for calm inland waters, with high sterns, an unsealed deck, no keel, one square sail on one mast, and a huge rudder and tiller. They were more economical for cargo than Red Seal-type ships, but could not safely perform ocean crossings. Unfortunately, sailing to Edo along the coast of Honshu from either direction requires rounding a cape in the open ocean. In adverse conditions, the giant rudder was prone to break, listing the ship and admitting water to the hold. For stability the crew would then cut down the mast and sometimes jettison their cargo of food. This left the crew completely unable to control the ship and at great risk. Only a few hyoryumin drifters survived, some even reaching North America. The risk of drifting was well known (90 episodes were listed by Arakawa Hidetoshi). For clans or ship owners, drifting meant the loss of a vessel, a cargo, and a crew. I'd have anticipated builders to adopt design changes to reduce the risk, but they may not have; the disasters kept happening for centuries. Why did the sengokubune continue in use? Were the lost ships insured? Were the additional costs of keels, lower sterns, or watertight decks really prohibitive? Sources: Katherine Plummer's The Shogun's Reluctant Ambassadors and marinemodelartist.com. I believe this is somewhat overstating the risks and well as the severity of the disasters. A sengokubune (千石船) refers to a ship that can carry 1000 koku of rice (sen = 1000). 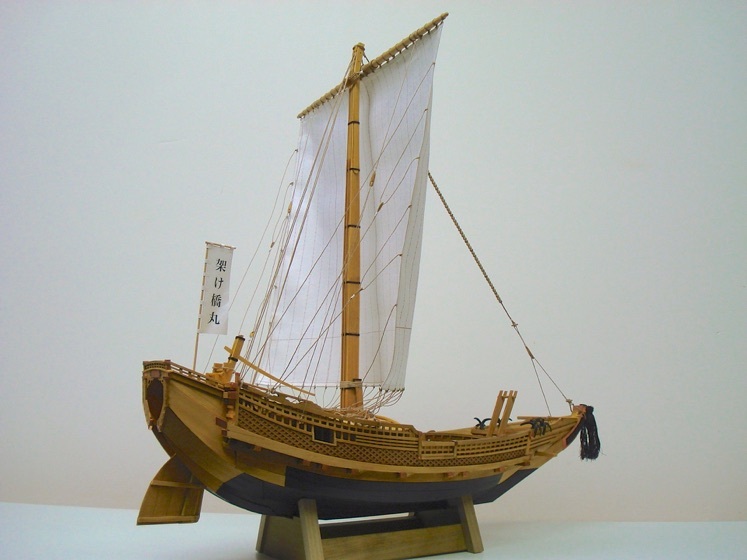 The actual ship design being referred to is known as a benzaisen (弁才船), originally a type of small cargo boat developed in, and for use within, the Seto Inland Sea. In their calm, natural habitat, these ships were perfectly safe for their time. Even venturing out to the coastal regions weren't actually a problem in the appropriate weather. On the Pacific side, the benzaisen being rendered adrift became frequent only from the middle of the Edo Period. The need to supply Edo's mass consumption market meant shipping could not cease in the winter months when strong northerly winds blew. 山田淳一. "弁才船の漂流--なぜ帆柱を切ったのか." 海事博物館研究年報 37 (2009): 30-35. In other words, it was only a problem because lucrative business opportunities made it financially profitable to risk making the voyage under less than ideal conditions year round. However, there was no real "ocean crossing" involved in these voyages. As the above graphic demonstrates, the shipping lane hugged the coast of Japan. Moreover, major settlements dotted the route. Consider also that, after some early refinements, these ships were regularly making the entire run from Osaka to Edo in under a single week. Thus, when weather conditions take a turn for the worse, safe harbour was almost always a short sail away. For context, there was as many as 1,400 voyages per year on the aforementioned Osaka-Edo route by the higakikaisen cargo ships around 1700. In the Genrokue Era each year as many as 1,400 voyages by the higakikaisen ships were made between Osaka and Edo. Kojima, Ryouichi. The significance of reconstructed Japanese traditional wooden vessel ‘Higaki-kaisen Naniwa-maru’" 日本船舶海洋工学会講演会論文集 22 (2016): 31-36. Of course, this is only one route, so the total number of voyages were likely much higher. Based on clarification from the OP, the figure of "90 incidents" came from a 1962 work by Professor Arakawa Hideotshi which, according to a bookstore listing, covered cases of adrift ships spanning ancient, medieval, and early modern Japan. It is unlikely that the given number is restricted to only sengokubune from the Tokugawa period. It should also be noted that the sengokubune were relatively small vessels operated by only 15 people each. [T]he fact [is] that, generally, a sengokubune, which had a capacity of ninety-eight gross tons, had a crew of about fifteen. Kono, Hideto, and Kazuko Sinoto. "Observations of the First Japanese to Land in Hawai'i." The Hawaiian Journal of History, vol 34 (2000). Even if all "90 episodes listed by Hidetoshi" were sengokubune ships, that is a death toll of perhaps at most 1,350 (in practice, many of them would have survived on ships that were afloat, but rudderless). In 1703 alone a single storm in the English Channel killed over 1,500 sailors. So in comparative terms, judging by the currently presented evidence at least, Tokugawa shipping does not seem unusually deadly. Finally, could the Japanese have solved the problem? Certainly - and they did. The existence of the much larger, ocean-going red seal ships proves they could overcome the issue with the sengokubune had they wanted to. It comes down to the fact that as a minor coastal cargo ship, it was not necessary for the sengokubune to be capable crossing the ocean, nor would it have been economical. Around Meiji 10, the construction cost of a benzaisen is estimated to be abound 1,500 yen; in contrast, a western style sailing ship is 7,000 yen. As a sidenote, perhaps the lack of ocean-going capability is a feature, not a bug. Tokugawa Japan is famous for its sakoku policy. As one component of the closed nation, Japanese ships were not supposed to to sail to other countries, which are necessarily across the ocean. Thus, there was no need to build ocean going ships, so not only were the coastal sengokubune economically efficient to operate and cheap to build due to the lower requirements, it was also politically correct. Not the answer you're looking for? Browse other questions tagged japan transportation age-of-sail disasters ships or ask your own question. Does Japan have the constitutional and legal right to have its own army or navy? Why was the arrival of the Hindenburg considered newsworthy? What plumbing did well-equipped sailing ships have? Could Magna Graeca have expanded beyond the Mediterranean sea region? Does the HMHS Britannic wreck still have a grand staircase or any staterooms?